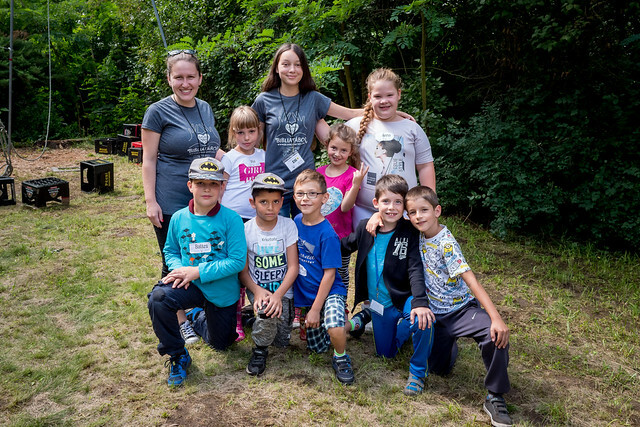 Above: The campers’ began each day with English reading time in small groups. 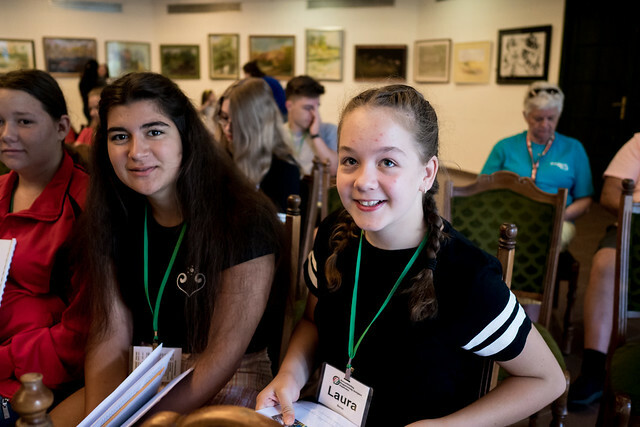 The curriculum takes them through various Scripture and not only helps them practice reading and learn new vocabulary, but helps them see the life of Jesus Christ. 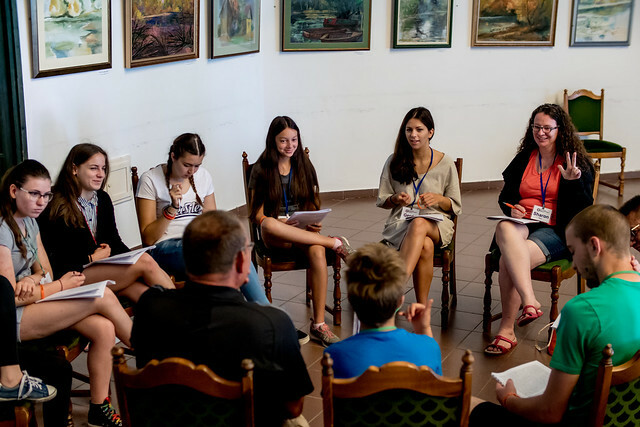 Each of these groups is mixed with advanced and beginner students, so there is a translator that assures all understand what is being discussed. Sharon led the group above with Gerda (seated next to Sharon). 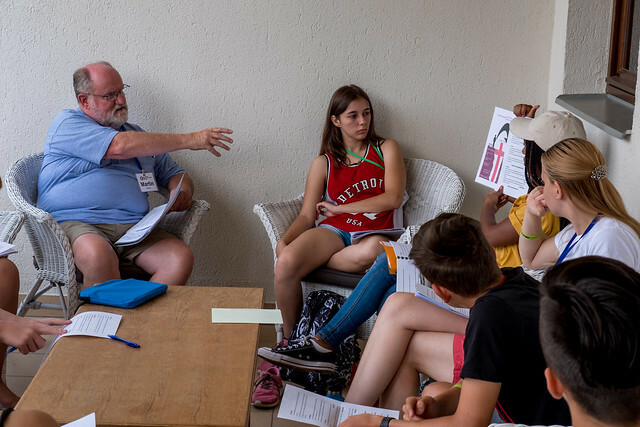 Above: As the week progresses, we come to a day where we focus on giving the campers a clear Gospel presentation in their morning reading small group. Above: Later that night, our evening activity (which is usually some kind of game or group competition) is a time of staff sharing testimony. 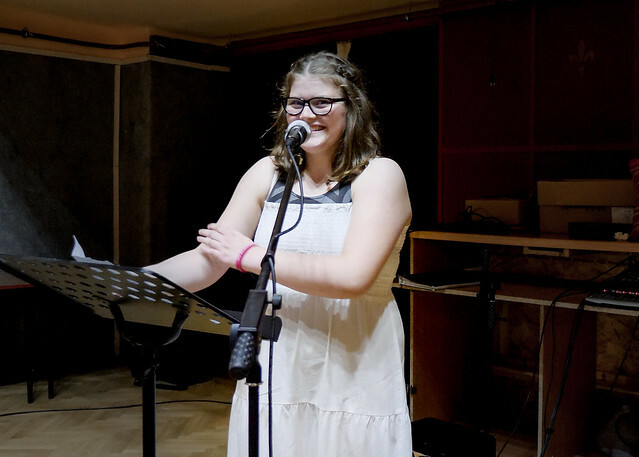 Gerda was able to give her testimony It was very encouraging to hear her story. 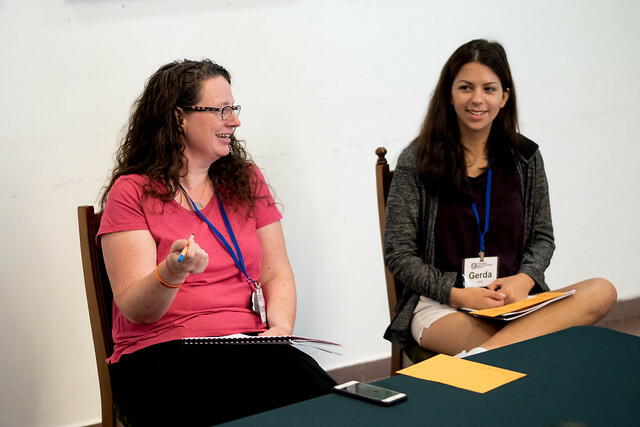 Her mother sent her to our camp years ago, but Gerda didn’t know it was a “Christian” camp. When she found out, she wanted to return home right away, but her mom didn’t allow it. As the days went by, her heart was softened and truth began to take hold of her heart. She is one of the many examples of past campers whom God has saved through this English Camp ministry. And what a joy to see her sharing her testimony and serving along side of us in camp! 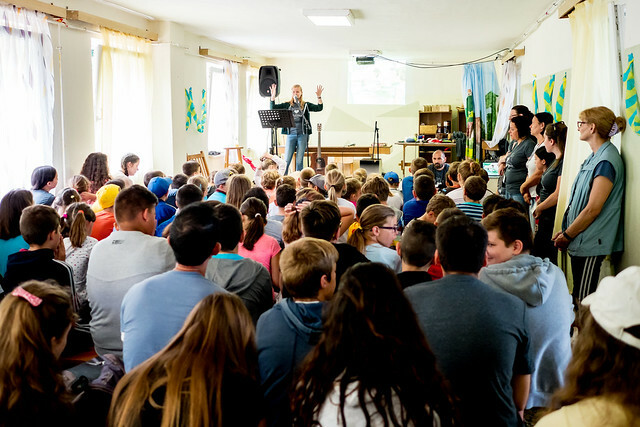 Above: After a few testimonies, Pastor Jeff proclaimed the Gospel to the kids and we invited any campers that had more questions or wanted to talk more about what they heard to stay afterward. We wanted to encourage those who were ready to make a decision, to repent and believe in Jesus for salvation. Some who stayed afterward, just wanted to talk, some needed prayer, and some made decisions to put their faith in Jesus. Above: Ádám (pictured above, left) is one who stayed afterward. 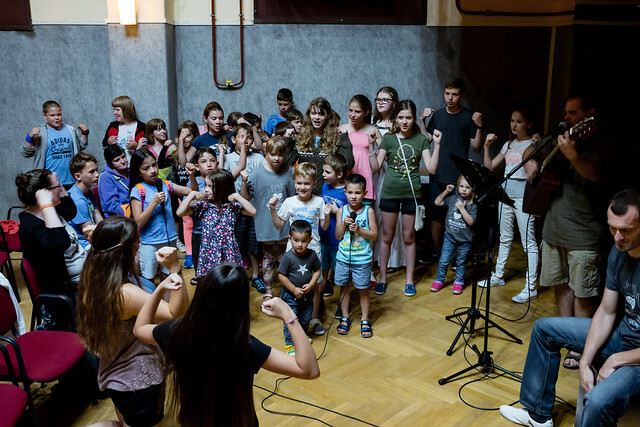 Even though Ádám doesn’t live in our town of Petofibanya, he has attended many of our VBS camps because he is related to one of our church members. 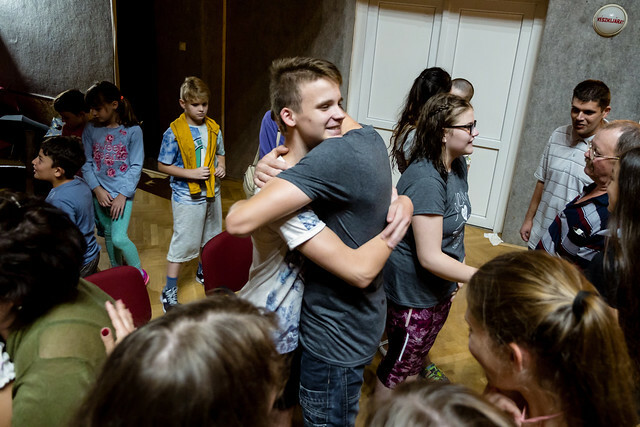 It was great to see that the seeds that were planted over the years continue to be watered by God’s grace and He is causing growth in Ádám’s heart. 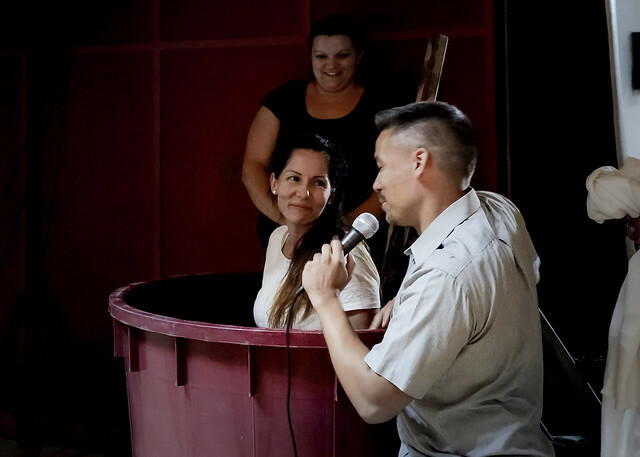 Above: Tázi (pink shirt above) and Laura (black shirt above) also chose to stay afterwards and they both made decisions to put their faith in Jesus. The following day, I got to speak to Tázi about some fear she was experiencing throughout her life. I shared some truths about her new position as a child of God, about God’s love for her and presence in her life and basics about using Scripture in spiritual warfare and prayer. The day after this conversation, she told me she slept peacefully through the night and was able to pray. Please pray that Tázi would find someone to continue to help her grow in Christ. 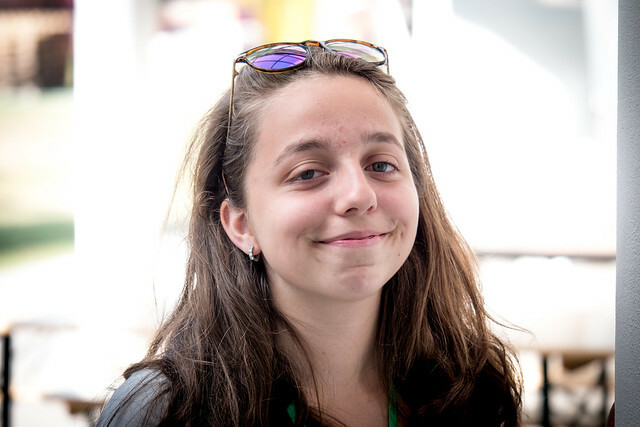 Thankfully, she lives in Vecsés where there is a living church with a good youth group where many who served at English Camp attend. Above: The first person I talked to after the Gospel presentation was Marcel (pictured above center). Marcel said he was a believer in God and prayed often. 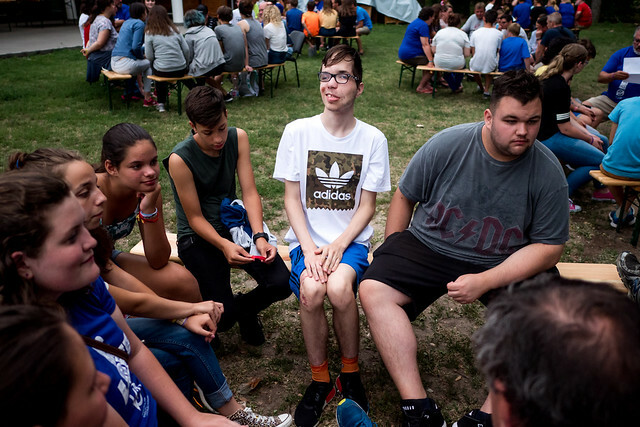 He believed everything that was shared but he is not connected to a church and because he is “different” has fears of meeting and being open with people. I think God was calling me to just encourage Marcel to take more steps to mature in his faith in Jesus. We gave Marcel a Bible the last day and I encouraged him to become part of a local body of believers. 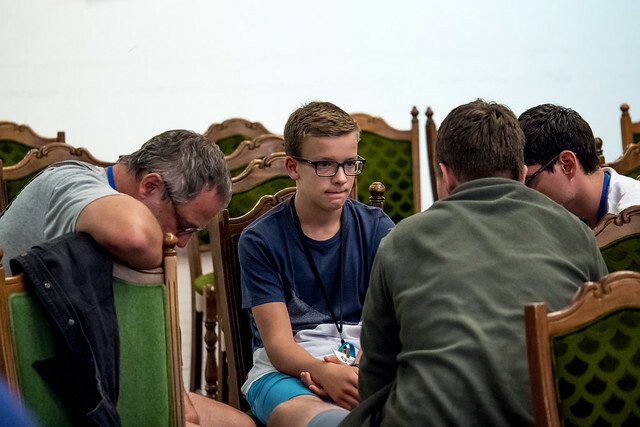 Please pray that his experience at camp, getting to know many of us who expressed love and acceptance, help him to take first steps into a church body without fear. 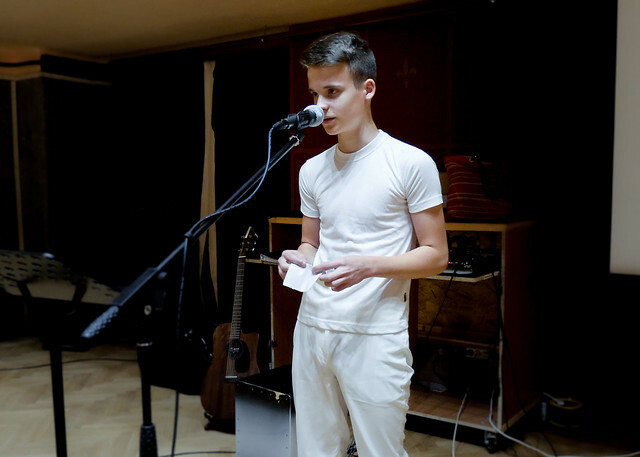 Above: Ákos is another young man who stayed afterward to talk. He was not ready to make a decision, but was just “blown away” by all that he was hearing at camp. Praise God for the work He is doing in campers’ lives. Above: As I left the meeting room that night I saw Anna sitting with one of our staff. Since Anna was in my English class, I had already gotten to know her, so I sat down and asked her what she thought about the night. It turned out that she has had some bad experiences with others that claim to be Christian, but live lives that are not at all attractive. She said she just needs more time to think about everything she has heard. This is the case with many campers who did not stay in the meeting room afterwards, but ended up discussing more with staff outside or in their rooms that night. Please pray that God would cause growth to al the seeds that have been planted this past week. 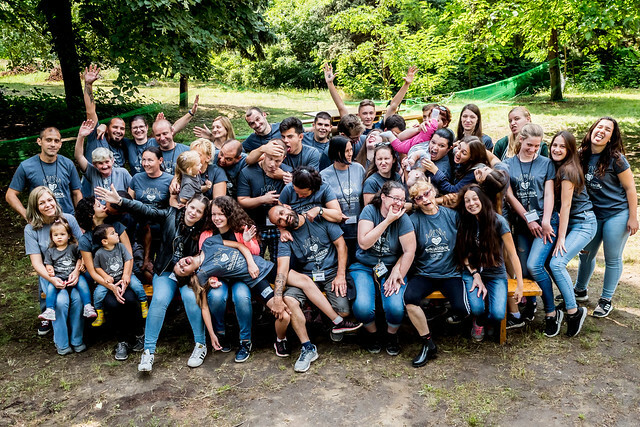 Above: The wonderful (and crazy) group of volunteers who served in English Camp this year. Thank you all for your continued prayers for our family and ministry in Hungary! This week, we’re going to rest and recover. 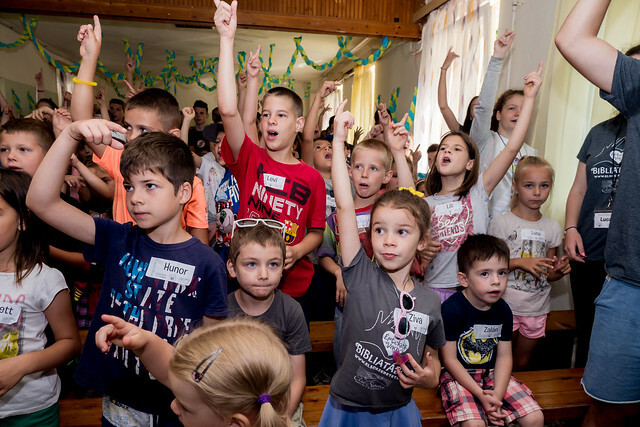 Next week, we’ll be having a one week Vacation Bible School in the town of Jászfényszaru. This is a town where we have been focusing on for church planting over the past few years. 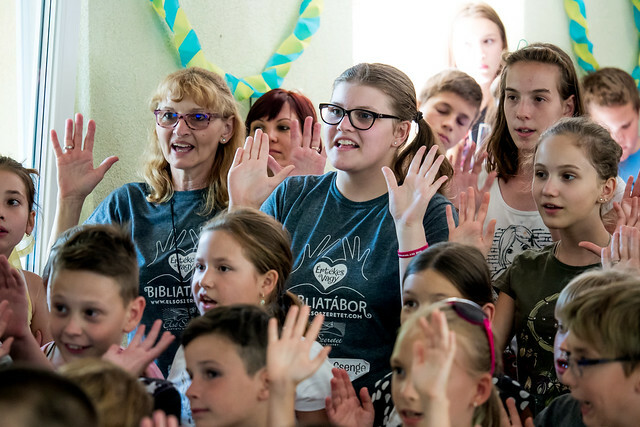 Please pray for the Lord to use this VBS as a mighty tool in proclaiming His love and His Gospel and that we develop many new relationships with families in Jászfényszaru. Enjoy the following films that give highlights from last weeks English Camp! Above: Kids singing together just before being dismissed for Sunday School. Praise God for a joyous time of celebration as Timi, Csenge and Szabi were baptized this past Sunday in Petofibanya following our VBS. 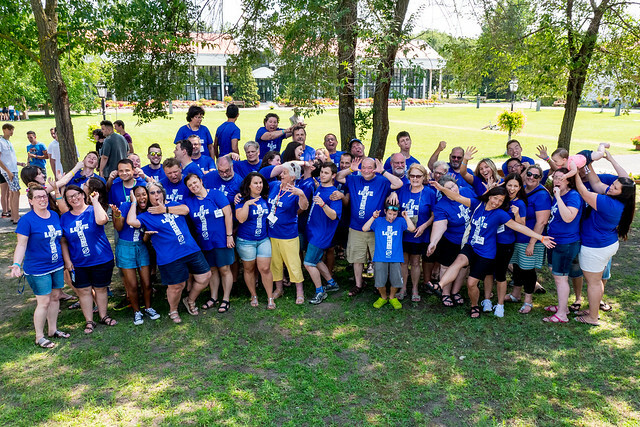 As you’ll realize through their testimonies, God has used camp ministries in a very significant way in drawing them to Jesus and finding salvation in Him. Here are some excerpts from their testimonies. Timi’s testimony: I grew up with a religious background and was even christened as a child, but I had never experienced or felt what I did when I first attended the Vacation Bible School last year with all of you. 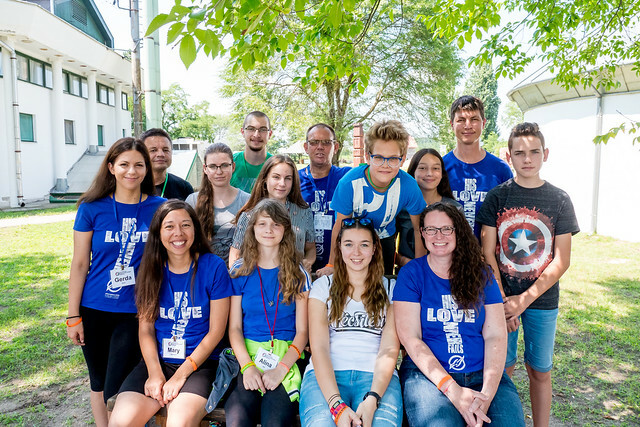 There was something I could not explain, something that was unique that I saw when I attended the family day at VBS that I also knew I needed. When we returned home from VBS I began reading the Bible and listening to Christian worship music. VBS came again this year and I was able to attend the last day for parents. It became very clear that I had a wonderful family, beautiful kids and a husband that loved me, but there was something missing in my life. And I could never truly say I was happy because that something was always missing. I was missing an everyday personal relationship with the Lord. And this is something no one can take from us. Above: Family members greeting Csenge before her baptism on Sunday. Csenge’s testimony: I knew God existed but didn’t seriously pursue a relationship with Him. He always seemed distant to me. I went through some very difficult years and felt as if life could not get any worse. I felt hopeless. I often wept and took these hurts that I was experiencing and turned them against others in my life. I knew this wasn’t right but it was my shield that I used to protect myself from the world I lived in. I attended a Catholic school and attended classes about faith, but none of the students took it seriously and I often got into trouble with the teachers. In second grade, I began going to Vacation Bible School here every summer and always enjoyed it. The fifth summer when I attended camp, a miracle happened in my life. In our small group time (with Eniko) I began asking many questions about God and about His love. And in that small group meeting time, I decided to put my faith in Jesus Christ and give my entire life over to Him. I had never experienced the peace and relief that I experienced in that moment. I knew that my decision didn’t mean that I would now have a life free of problems. I experience difficulties in relationships, I sometimes doubt and sometimes fall apart. But God has given me strength as He never leaves me. He gives me the power to continue moving forward and He has the power to heal every one of my wounds. His love is so powerful. Since I’ve put my faith in Him, He has taught me so much. He has taught me to forgive and release the hurts. He has taught me to believe and to love. He has showered me with gifts over these past three years that are too many to list. I just want to follow Him and live in His love. 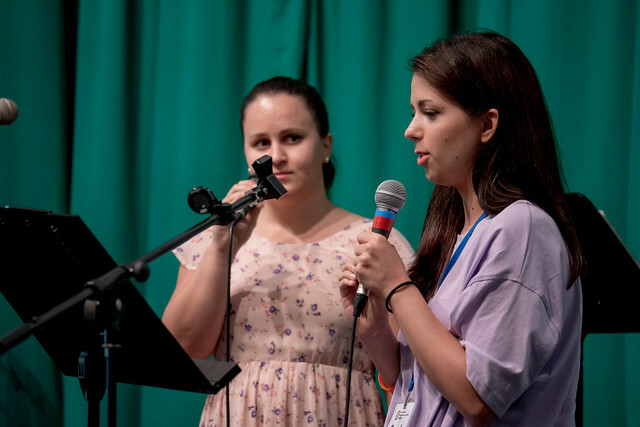 Szabi’s testimony: Without Jesus, my life was much harder. I didn’t have very good relationships and often got into arguments with my parents. I’ve heard about Jesus since I was a child and things would have been much different if I had just payed attention to Him. Last year at English Camp there was a night when people shared how they came to know and believe in Jesus. Afterwards, I began to think about whether I was going to continue living in sin or begin following Jesus. I chose to follow Jesus. 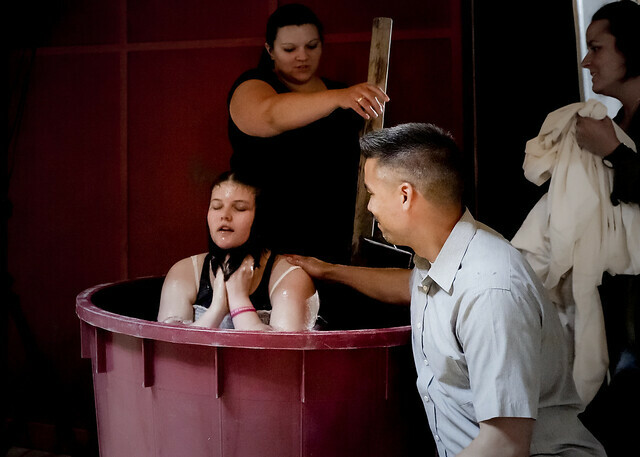 Above: Szabi’s dad Peti had the privilege of baptising his son on Sunday. 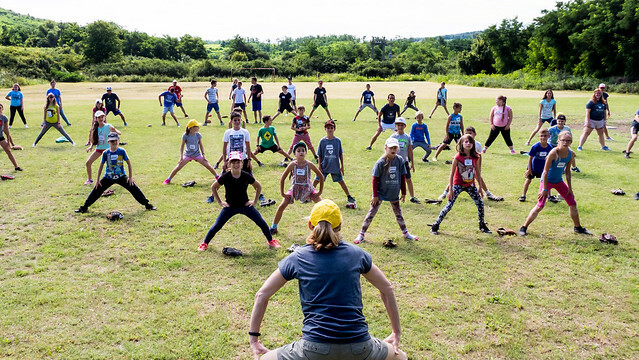 Last week, with the help of a team from the US, we held a baseball camp for kids in our community. 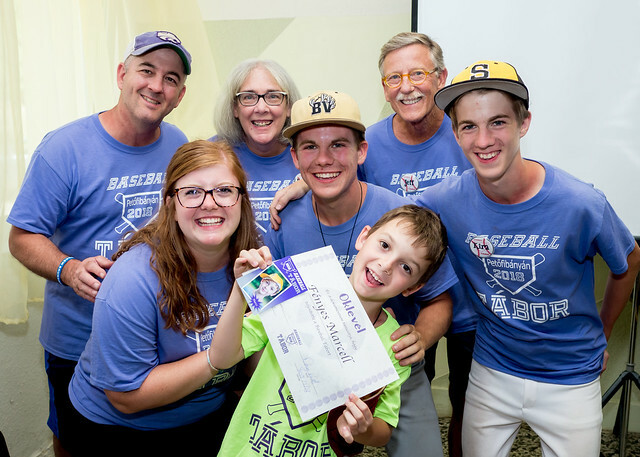 Based on the interest level of last year’s Baseball Camp, we expected twenty to thirty kids to attend and were surprised when we had sixty kids register! 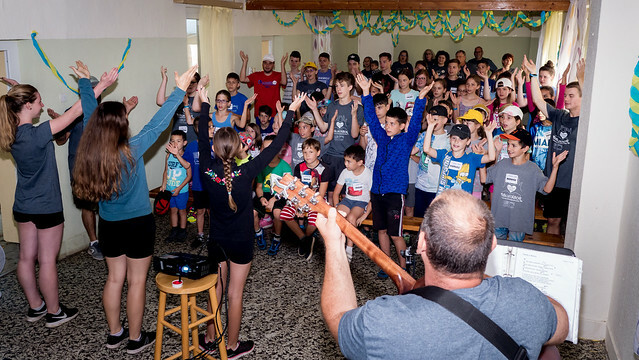 Many of the kids had just attended our VBS and this was a great way to keep the momentum going in teaching more about Jesus Christ and salvation. Some of these kids will be with us throughout the entire summer as they are attending two of our VBS camps, our baseball camp and English Camp. 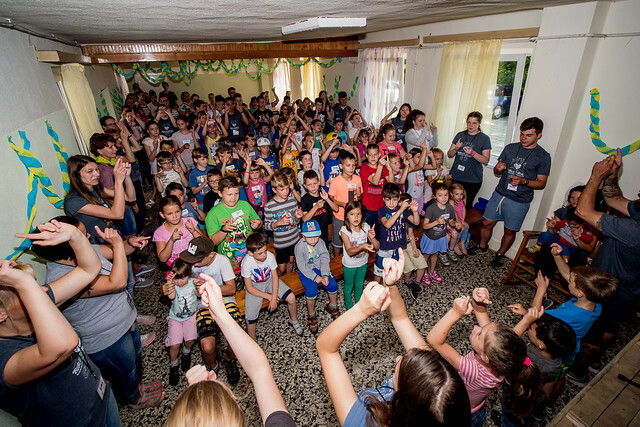 Please pray that God would use all of us serving in these camps to reflect Him and faithfully proclaim all that He wants to reveal to these kids. Pray that the seeds that have been planted would take root and grow so that we would see more and more stories like Csenge’s above. Above: The team from the US giving Marci his certificate on the last day of camp. This week, we’ll have some time to rest, recuperate and also prepare for English Camp which begins on Saturday. Praise God that the majority of kids that are attending from our area have already put their faith in Christ! 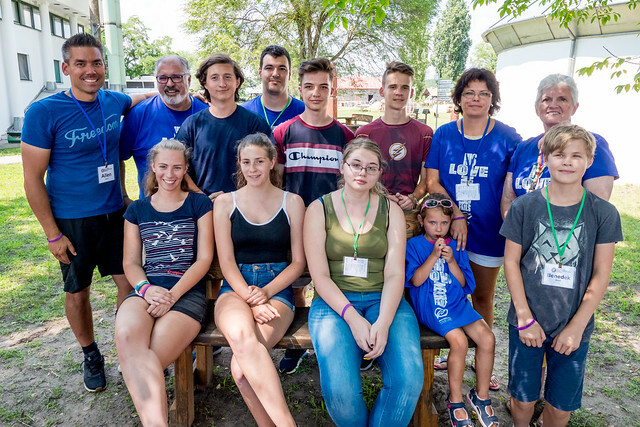 As they spend time with believers from all different walks of life, please pray that they be encouraged in their faith and that they also would have opportunity to encourage other first time campers to believe in Jesus Christ as Lord and Savior. Take a look at the highlights from our Baseball Camp in the films below. Maybe you could join us and help in Baseball or English camp in the coming years? Thank you all for your continued partnership with us. 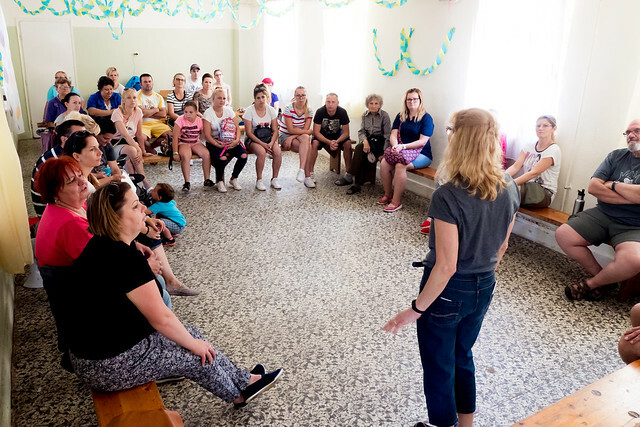 God has used your generosity and faithful commitments to build a strong platform in Hungary to proclaim His good news. We are thankful for all your help! 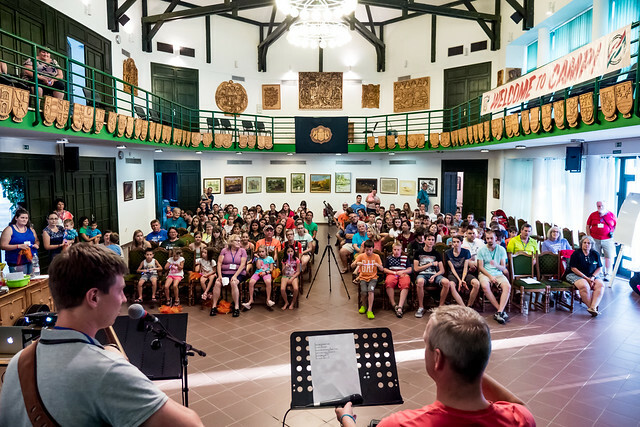 Last week, after months of preparation and prayer, we held our summer VBS in our hometown of Petofibanya. 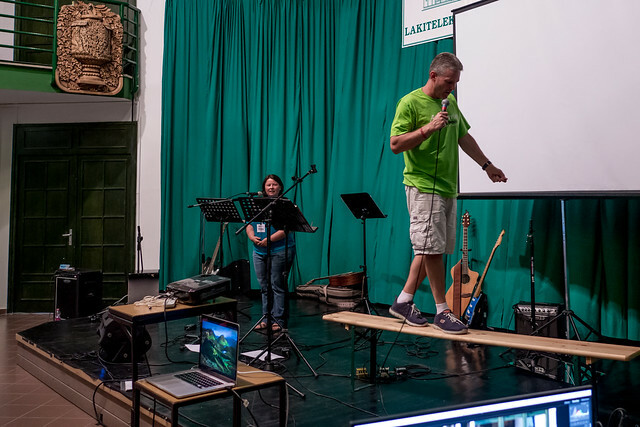 Over the years this has been a powerful way for God to reveal His Gospel not only to the children that attend but also to parents in the community. 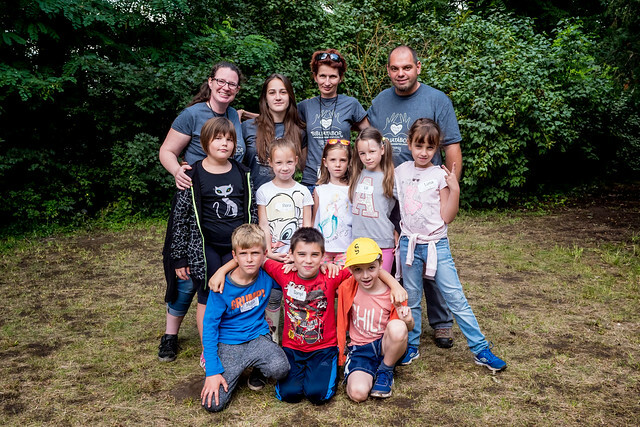 The majority of the 100 kids registered don’t come from believing families and for most of them this camp is the highlight of their summer. We’ve seen through the years that mostly all of them return year to year with limited advertising. By God’s grace, we have maintained a good relationship with the local government and they allowed us to use Petofibanya’s beautiful camp ground space. 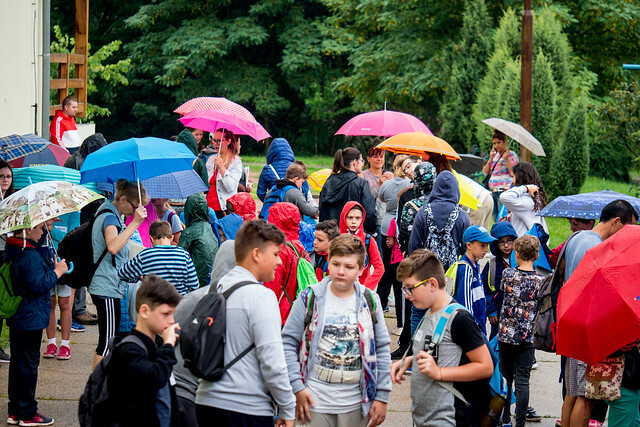 Above: Because of the limited space in the indoor facilities we are using and the number of kids that attend, it is vital that we have weather that allows us to be outside the majority of the day. A few days began with overcast skies and forecasts of rain (even predicting 100%). One of the mothers was overheard saying that rain wouldn’t be a problem because ‘they’ (meaning us) pray. God was powerfully at work moving storm clouds around us while in neighboring towns there was downpour. We were blessed with pleasant weather the entire week! Days that began with a drizzle cleared up by the time the kids walked to the campgrounds. This was a huge answer to prayer and a testimony to God’s power. 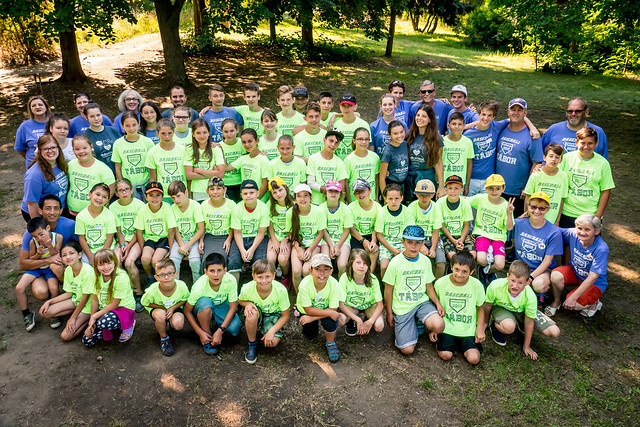 Above: One of the beautiful stories of this year’s camp was seeing God’s work in Edit and her granddaughter Csenge (pictured in grey shirts above with hands up). Csenge put her faith in Jesus at a previous VBS and this year she decided that she wants to be baptized! We asked Edit to take part in the small group that we hold for the parents that attend the closing day of camp. 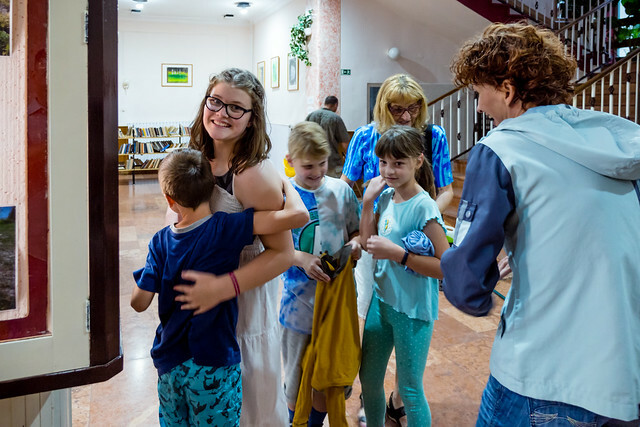 Edit has spent the majority of her life in Petofibanya working with children as a teacher. It was a blessing to see her now sharing her testimony of how she met Jesus with parents, many of whom were her students over the years. 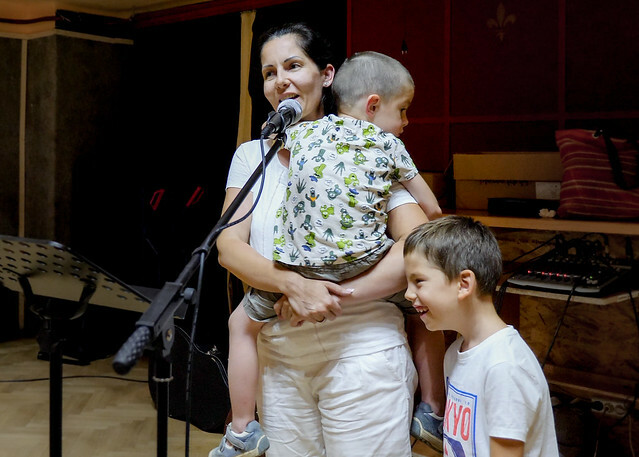 Part of Edit’s story goes back to her attending VBS with her grandchildren (like Csenge) and seeing that there was something different about us that was missing in her life. As she continued to attend each year and began asking more questions and attending our church, she found Jesus. What a blessing to hear her retell the story of receiving her first Bible from our teammate Brenda as a gift and how it has impacted her life. What a work of God to see her standing before many fellow students with an open Bible boldly reading God’s word and impacting the lives of others. Timi, one of the parents (third one seated left above) was part of the small group and heard Edit’s testimony. Toward the closing of the day, I was invited to join our Hungarian teammate Erika to talk with Timi. Timi shared that she was touched at last year’s VBS and understood that she needed Jesus. However, after VBS ‘life’ as a working mother of three seemed to keep her from taking any more steps. 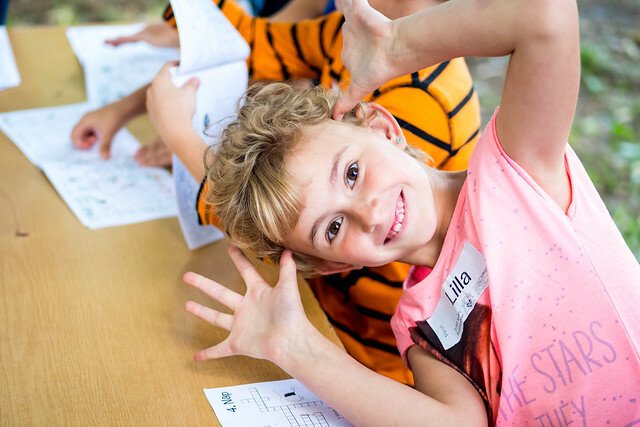 This year, she didn’t want to wait any longer and at the end of VBS she put faith in Jesus as Lord and Savior. Timi is planning on being baptized this Sunday! Above: I also rejoiced at seeing the youth take on more responsibility and helping in new ways this year. Our daughter Elianna (center) was able to help teach one of the 9 small groups at camp. Our Hungarian teammate’s daughter Anna also co-led and brought lots of encouragement to the younger girls in her small group. 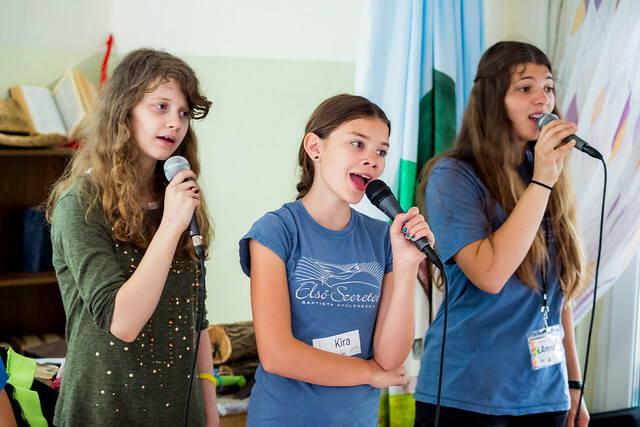 Above: Our daughter Kira (center) helping with Alina and Anna for our singing time. 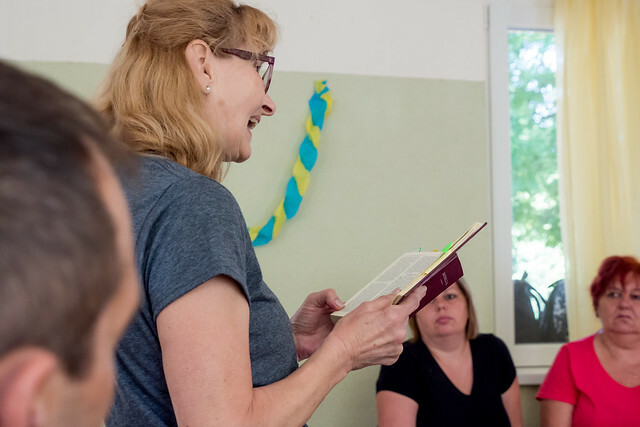 Above: Eszti (also a former VBS camper) now teaching for Friday’s concluding lesson. Above: Praise God for giving our team unity and the joy of serving together as one in Christ. Take a look at the films below and rejoice with us for the great things God has done through this VBS! And please pray for Timi, Csenge and Szabi who are planning on being baptized this Sunday. Thanks for partnering with us!